The city of Macon, known for its deep cultural heritage and history, offers a small town culture with envisions of a growing future. The city of Macon, located in Bibb County, is socially stimulating and offers great organizational, educational, and civic opportunities for visitors and residents alike. 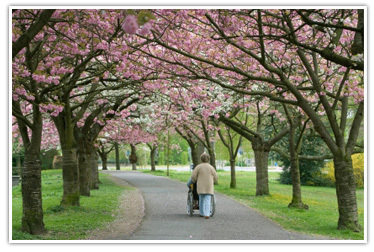 Macon is known as the "Cherry Blossom Capital of the World" with over 275,000 Yoshino Cherry Trees throughout the city. The Cherry Blossom Festival is held every spring and offers various venues of entertainment, shopping, arts and crafts, shows and most importantly, the blooming of the trees. The desirable climate allows families to enjoy recreational activities in the numerous parks around the area. These parks include amenities for baseball and football games, walking and nature trails, swimming, picnic areas, gymnasiums, and conference areas. The Macon area also maintains numerous private and public golf courses and tennis centers. Macon houses two professional sports teams, The Macon Knights Area Football Team and the Macon Blaze, an umbrella organization of the World Basketball Association. Both teams play from April to July and are available to the public at affordable prices. Macon is also the home to various major state attractions such as The Georgia Music Hall of Fame, The Georgia Sports Hall of Fame, and the State Fair. Major historic landmarks are scattered throughout the city including the Hay House, the Cannonball House, and the Woodruff House, all of which date back to the mid-1800's. A variety of museums, tours and trails are also available to attract locals and tourists. Macon has several artistic organizations that sponsor various performances and events throughout the year at local venues such as The Grand Opera House, Douglass Theatre, and Theatre Macon. Macon prides itself on the availability of fine-dining, especially in the downtown area. The variety of restaurants lets you choose from original Southern cuisine, to Italian, European, Hispanic or Chinese eateries. The downtown area also provides patrons with fine coffeehouses and small cafes. The impeccable Macon and Bibb County School System is an excellent source for pre-kindergarten through twelve grade educations, with thirty-one elementary schools, five middle schools, and five high schools. Macon also has fifteen private academies that offer educational opportunities for elementary, primary, and secondary levels of schooling. The Macon area also offers five higher education opportunities through four credited colleges and one technical school. Transportation around the Macon area is made easy by county busses, Greyhound Bus Lines, Middle Georgia Regional Airport, and the proximity to the city of Atlanta. Macon prides itself on public safety with four precincts within the Macon Police Department, eighteen fire houses within the Macon-Bibb Fire Department, and a various number of emergency services and crime prevention programs. The Macon area also provides the best medical services in middle Georgia with various medical center, urgent care centers, and hospitals. For those wishing to take full advantage of all that Macon and Bibb County has to offer year round, Southland Custom Homes is a custom builder in Georgia that specializes in custom home building for the Macon area. Southland Custom Homes is an on-your-lot custom home builder, meaning that they build the home of your dreams in the location of your choice! With over a 100 floorplan options to choose from and an array of top-of-the-line interior appointments, Southland Custom Homes is among the premier custom builders in GA. In addition to providing a huge selection of plan options, Southland Custom Homes will even work with new homebuyers to alter a specific floorplan so that it is exactly what the buyer wants. If you are looking for a custom builder in Macon, GA, Southland Custom Homes is sure to meet and exceed your expectations. Southland Custom Homes, a custom builder in Macon, GA has model showrooms located in Macon(3956 Bloomfield Village Drive, Macon, GA 31206), Dawsonville(98 Bethel Drive., Dawsonville, GA 3053), and Marietta(265 N. Cobb PKWY, Marietta, GA 30062). Stop by or call us today at 1-866-56-BUILD* to see all that Southland has to offer!